Tsitsel Rye for sale. Buy online at Zingerman's Mail Order. Gourmet Gifts. Food Gifts. 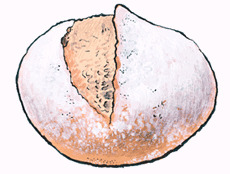 A round, tall rye bread dusted with rye flour. Tsitsel means breast in Yiddish, and this loaf is, well, breast-like in shape. In some ways, it's the "purest" rye we sell, since there's no caraway seed (ground or otherwise) in the mix at all. Tsitsel bread has a cool, moist, chewy center and a nice crust, all of which makes it a great dinner bread. Better still, try it spread with sweet butter and smoked fish for Sunday brunch. A nurturing way to start your day. Spread with Michigan Farm Butter and Early Glow Strawberry Preserves.